Do you manage or edit a large online publication powered by WordPress? Do you have several writers contributing to your site at any given time? Does your online business involve registering numerous WordPress accounts for users? By default WordPress provides subscriber, contributor, author, editor, administrator role. These roles grant same or different access for some site features such as creating new post, uploading media, deleting post, managing post, managing option etc. If, however you want to be able to have improved control over user management, here are a few WordPress plugins that can help you alter, extend or change the capabilities for different roles in your website. Following are some more related articles that you may like to browse through: Free WordPress Social Connect Widgets, Premium WordPress eCommerce Themes, Free Photoshop Dreamy Actions and Restaurant Menu Plugins for WordPress. The most advanced protection against sploggers and spam users registration, is fully WordPress,WordPress MU, BuddyPress and bbPress 2.0 compatible. Use a service that does not comply with all European laws or send information without encryption, it can mean heavy fines. If you don’t want to use secure connection, you can disable it from WangGuard configuration page. vCita CRM provides insights and tracks all user interactions with your team. It helps you save time with automated client communications, notifications and reminders. Together with vCita LiveSite, vCita CRM helps optimizing your WordPress websites and encourage visitors to take action on your site. Use shortcodes to insert registration, login or profile editing forms on any page of your website. Users are created in tables separate from the main WordPress user tables so that they have no access to the back-end of your site. Presspoint has an improved UI, more features, and better support, to meet the needs of nonprofits and small businesses who want to connect and interact with their customers and constituents through WordPress. This plugin track records of wordpress user login with set of multiple information like ip, date, time, country, city, user name etc. Allow users with specific WordPress roles to delete themselves from the Users -> Your Profile subpanel or anywhere Shortcodes can be used using the Shortcode [plugin_delete_me /]. Settings for this plugin are found on the Settings -> Delete Me subpanel. Multisite and Network Activation supported. 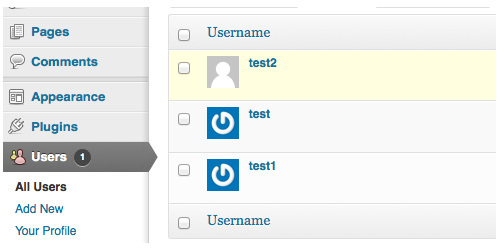 The New User Approve plugin modifies the registration process. When a user registers for the site, the user gets created and then an email gets sent to the administrators of the site. An administrator then is expected to either approve or deny the registration request. WordPress already comes with some basic user management functions – WP-CRM expands on those functionalists by allowing you to organize your users using custom attributes, find them using filters, and keep track of correspondence. This plugin lets you approve or reject user registrations. While a user is unapproved, he/she can’t access the WordPress Admin. On activation of the plugin, all existing users will automatically be flagged Approved. The blog admin will never experience restricted access and does not need approval. Admins have to confirm each user registration. A notification will be send when the account gets approved.